Six weeks come and go quickly, according to Pharmacy Technician Coordinator Lindsay Mancuso. Even though the six weeks fly by as an educator, the knowledge that is gained and positive work environment drives the students and Lindsay to continued success. Lindsay graduated from Grafton High School in 2008. After high school Lindsay did not hesitate—knowing the direction she wanted to take her education. Her love for pharmacy inspired her to gain her Certified Pharmacy Technician Certification through the Pharmacy Technician Certification Board. 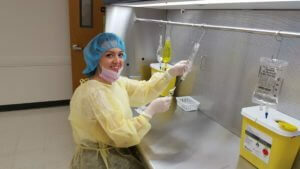 After gaining her certification she began her career at Kroger Pharmacy in 2009. This was her first “real- big girl job.” This job taught her to apply her knowledge and skills in the pharmacy world, but also the joy of customer service. Being able to communicate to her customers and help them to understand their medication was a challenge that she hadn’t considered. However, she quickly became the ‘sweet lady’ that enjoyed helping others and giving back to the community. Lindsay had a desire not only to learn, but also to give back and share her knowledge with others. While scrolling through jobs one day she came across the Pharmacy Technician teaching job here at WVJC. She was excited, knowing that her dream was to teach what she knows about the Pharmacy world to the minds of younger people who need direction. Lindsay wanted to continue her love for Pharmacy, but also be able to share her knowledge and experiences with the students. She began working at WVJC in April 2013 and she quickly became a well-respected teacher, wonderful leader, and inspiration to many WVJC students. After teaching for a short time, Lindsay made the decision to continue to better herself. She is currently enrolled at Fairmont State University perusing a Bachelor’s of Science. She is expected to graduate in May of 2018. It is safe to say that Lindsay is motivated, hardworking and very self-driven. Lindsay’s favorite quote is “climb mountains so you can see the world, not so the world can see you.” Her favorite part about working at WVJC is getting to know the students and watching them change their lives by pursuing their dreams. A perfect day for Lindsay is spending time with the ones she cares about and, of course, her Cat- Doughnut (after all she is known around WVJC as the “crazy cat lady”). In order to relax, she finds herself doing puzzles (we hope not of cats) and working out. Lindsay says that both puzzles and working out help her to relax and shut the world out for a small amount of time. She enjoys the healthy lifestyle of the gym to keep her energy up.